If the Cobblers are not careful, a centre-back could end the season as their top goalscorer. With previous leading marksman Kevin van Veen sold to Scunthorpe United last month, Aaron Pierre’s six goals is bettered only by Andy Williams’ seven within the current squad. And with Williams’ game-time limited to just 60 minutes across the past four matches, Pierre, a strong, commanding presence in both penalty boxes, has an opportunity to leapfrog his team-mate. The 25-year-old took his tally for the campaign to six on Saturday when finding space in the box to convert Jack Bridge’s low cross on the stroke of half-time, squaring things up after Bruno Andrade’s earlier opener. “I was telling Bridgey that I was quite annoyed because I wanted the ball in the box earlier and I had to make my movements again,” explained Pierre. “But it was a great cross into the box and I was just fortunate enough to get on the end of it. I tried my best to get into the right position as early as possible and then think like a striker and luckily it fell for me. It would be good for me to finish top scorer this season but as a defender it’s about keeping clean sheets – scoring goals is just a bonus for me. Town only claimed a point on Saturday despite playing over half the game with an extra man, but Pierre, who again captained the Cobblers at Lincoln, felt it was a good result for his team. He added: “They’re top of the league so we see it as a positive point. We had a few chances in the second-half and could have won the game but at the same time they also had chances and might potentially have had a penalty at the end. 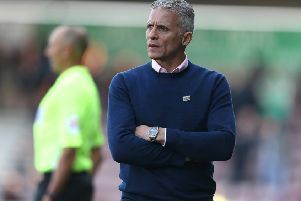 It was a boisterous atmosphere at a packed-out Sincil Bank on Saturday, and home fans were not shy in letting their frustrations known when decisions went against them. But Pierre shrugged it off, adding: “I’m not intimated by anything to be honest. It was a great crowd and obviously they’re going to back their team right until the end.